Rodama: a blog of 18th century & Revolutionary French trivia: The Carillon of the Bastille..cont. The Carillon of the Bastille..cont. The clock and its bells were installed in 1764 on the wall of the new block for staff officers built (as a prominent gold lettered inscription on black marble proclaimed) by Antoine Raymond Jean Gualbert Gabriel de Sartine, lieutenant of police. This divided the space between the monumental walls into two courtyards, the larger one being where the prisoners took their exercise. The clock faced into the main courtyard from the apex of the upper storey immediately opposite the principal drawbridge which was to be so fatefully disputed on 14th July 1789. It was surmounted by a tile-covered turret housing the three bells. Letters survive detailing payments to the clockmaker, Quillet, his disputes with the bell founders, and various subsequent adjustment and repair work. Note the clock has already been struck by lightning! ….... it must not be supposed, that the act of tormenting, with which they keep their captives in misery, is suffered to relax during this transitory interval : for it may easily be conceived, how little they can enjoy walking in a place so circumscribed; where there is no shelter from the rain ; where nothing but the inconveniences of the weather is experienced ; where with the appearance of a shadow of liberty, the sentinels that surround them, the universal silence that prevails, and the sight of the clock, which is alone allowed to break that silence, present them with but too certain marks of slavery. 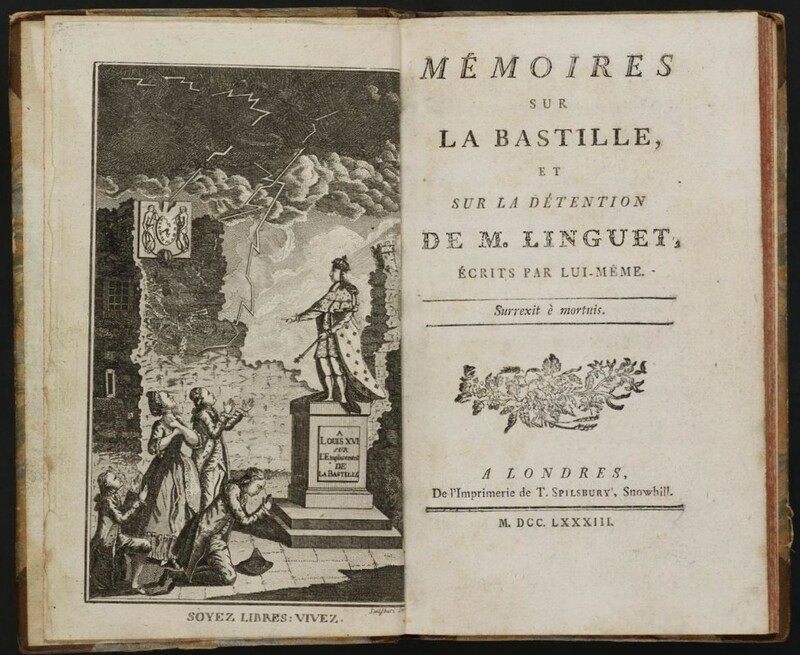 Such was the impact of Linguet's indictment, that the Baron de Breteuil, Louis XVI's enlightened minister, paid visit to the Bastille shortly afterwards demanding that the chains be removed, though sadly the position of the slaves could not be altered. Millin's Antiquités nationales corrects Linguet's iconography – the slaves are both male, representing youth and old age, indicating that both extremities of life are equally threatened by slavery. In the assault on the Bastille on 14th July the clock was subject to furious attacks and the commemorative marble plaque with its gold lettering broken to smithereens. It was later claimed that the clock stopped for ever at a quarter past five. The clock mechanism, however, survived the assault. Three days later, on the 17th, the Bastille's enterprising demolisher Palloy received a visit from a Master clockmaker called Regnault, with an order from the commander of the Paris militia the marquis de La Salle, to take possession of the clock and its bells. Palloy at first resisted but later surrendered them - the Bibliotheque Nationale has the receipt. The carillon itself subsequently resurfaced at the main administrative centre for the demolition effort, in the district of Saint-Louis-de-la-Culture, and was sold on to the foundry at Romilly-sur-Andelle (Eure), one of the key establishments providing copper and bronze to the Marine and the mints in Paris, Rouen and Orleans. At this point it was happily rescued by the director Daniel Grimpret who, finding it good order, installed it in the works as a curiosity. In the 1890s it was still there. On the 14th Brumaire of Year XI of the Republic (1802) the carillon enjoyed a moment of renewed glory when First Consul Bonaparte visited the Romilly Foundry accompanied by Joséphine and the Minister of the Marine, Kellerman. The bells were allowed to ring for an extended period to mark the occasion, which seemed to please Bonaparte - though the workers were more pleased by the fact that he awarded them the bonus of a month’s salary. The foundry changed hands, but successive owners jealously guarded the bells until, on the works' closure in 1897, they were finally sold to a merchant in the metal trade, who exhibited them at the 1900 Paris Universal Exhibition in the "Palace of Mines and Metallurgy". After this the trail becomes hazy, though they remained in Paris. According to one source they were reported successively in the attic of a factory in Saint-Denis, an apartment block in the Avenue d'Eylau and, at a later point, in another attic in the 4th Arondissement. They were certainly listed as being in the garden of No.11, Avenue d’Eylau in a street directory published in 1906 (Promenades dans toutes les rues de Paris, 16e Arrondissement, p16). In a recent account the journalist Pierre Bellemare tells a similar anecode to Jean-Louis Viguès about the carillon ringing spontaneously. He has a M. Dupré-Neuvy transporting the bells back to Paris from Normandy - almost certainly an error - and erecting them as a centre piece in his smart courtyard garden in the Avenue d'Eylau. One night, disaster struck when the whole quartier was awoken by the unbidden clanking of bells. It took a locksmith, called out in the small hours in police presence, to disable the mechanism before the carillon could be persuaded to stop. The mystery of what had happened was never fully resolved, though there was some talk of a passing cat. At this point the bells were abandoned and only rescued from the garden and repaired in 1914. It is not clear whether M. Neuvy was ever a doctor, but the carillon was certainly bequeathed by him in August 1955 to an invalid named René Bernard. Bernard was none too pleased with having to find storage and in 1957 hit upon the idea of giving his cumbersome legacy away to an old friend, Michel Lévesque, who long ago, as a boy scout, had befriended and supported him in hospital. Lévesque recorded his amazement when the huge packing case arrived out of the blue, but, sadly, he too had nowhere to store the carillon which was soon shipped out to the suburbs.